Hey everyone! I hope you all had a great weekend. I am still recovering from a cold I brought home with me from Ocean City last weekend. It really took a lot out of me so much so that I lost my voice about mid-week last week. That was great fun when I was trying to yell at the boys to stop fighting. Let's just say I got really good at charades these last few days. LOL! Thankfully my voice is back although I do sound like a raspy old man when I talk at times. Kinda fun when I answer the phone and people aren't expecting it. Hee! Okay enough about that! How about a layout share? This layout just went up in the Garden today at Two Peas In A Bucket. Our monthly theme was summer and since we had just returned home from our annual summer vacation to Ocean City I figured I would scrapbook a few of my favorite photos from the trip. Definitely the highlight of our vacation for my boys is getting to spend time with their cousins. My whole family (sister, brother, mom, etc) all go down to Ocean City together and it's such great fun to spend the week with everyone. I used a muted color palette on this layout which is pretty unusual for me since I tend to gravitate towards bright colors. 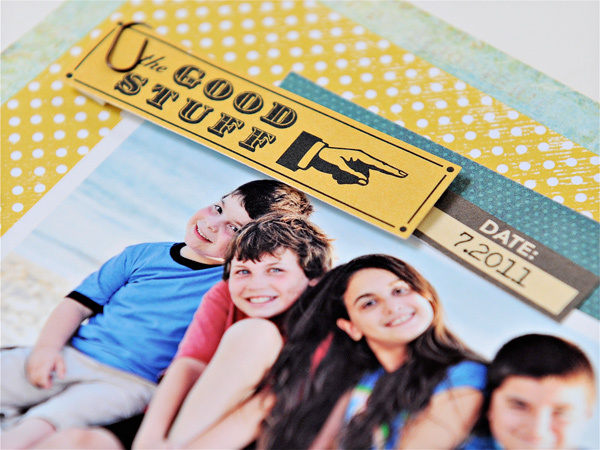 I combined lots of different patterned papers from several different manufacturers including Basic Grey, Crate Paper, Making Memories, and My Mind's Eye using the center strip with the surfboards as my color inspiration. The softer colors coordinated nicely with my beach theme and the colors in my photos. For my title I used a sticker from the Wander collection by Basic Grey as my base. The letter stickers are also from Basic Grey (Nook & Pantry collection) - I colored them with one of my Copic markers since they were not quite the right color for my layout. I do this a lot and it is a great way to customize stickers to fit your needs. I then stamped the word "vacation" right below and slightly overlapping my stickers using Brown Sugar ink from Jenni Bowlin and the Are We There Yet stamp set by Ali Edwards for Technique Tuesday. I LOVE adding these stamps to my titles, journaling, etc and it's so easy to place them since they are clear. I printed my journaling on a piece of Making Memories ledger paper that I've been hoarding for a few years now. I have an 8x8 pad of these papers and I will probably give a good, long, hard cry when they are all gone. They are just perfect for journaling! So be prepared and don't say I didn't warn you, k? ;) I added some stickers from My Mind's Eye and October Afternoon to my journaling along with a brad from Crate Paper (Toy Box collection) and a beloved mini clip from Tim Holtz. Great LO, Lynn! Those are some cute pics. 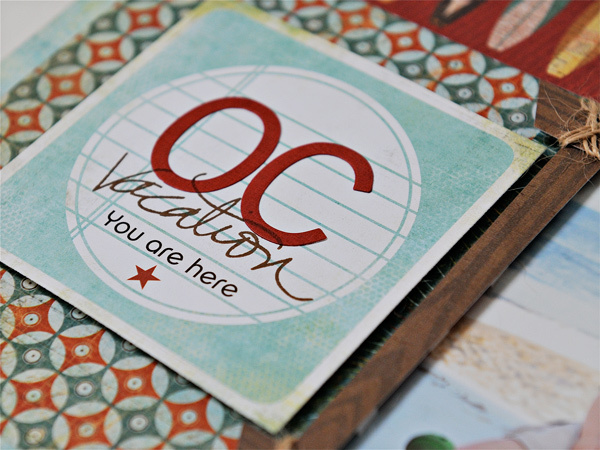 We go to OC almost every summer, too. Where do y'all stay? Cuteness, Lynn! I love how you tied the frame corners together! Great touch! So cute!! I too love the tied frame!! Awesome job at mixing all the mfr's.!! Looks so good!!! Love this page! Great design! You do well with muted colors! Glad to hear you're on the mend! i love this layout lynn! the colors are gorgeous! what GORGEOUS pictures! and the colors are delicious--great layout!